The word colic refers to an attack of abdominal pain or stomach ache suffered by a horse or pony. The horse pawing at the ground and kicking at or turning to look at its stomach. Loss of appetite - the horse not eating his feed. The horse laying down or repeatedly getting up and down. If you observe the above symptoms and that suspect your horse is suffering from a bout of colic, call your veterinary surgeon out immediatley. Colic can be fatal to a horse. While you are waiting for the vet to arrive, carefully follow any advice that you have been given over the phone. To diagnose colic your vet will ask you for a complete history of your horse or pony. and carry out a thorough examination. The examination will often include temperature, heart and respiratory rates, hydration, examination of your horse's gums and listening to the intestines with a stethoscope. It may also be necessary to perform a rectal examination on the horse to feel for any abnormalities. A naso-gastric tube may also be used which passes through the horse's nostril to the stomach and helps determine whether abnormal amounts of fluid are present in the stomach. Further diagnostic procedures are sometimes necessary and can include blood tests, peritoneal tap (passing a needle into the horse's belly to test for excess/abnormal fluid) or an ultrasound examination. Internal parasites such as redworms. The vet may treat your horse at the stableyard with anti-inflammatories, anti-spasmodics, sedation and fluids. Not all of these treatments will be used in every case, and the type of treatment will depend on the findings on examination of the horse or pony. If the veterinarian is concerned that the cause is something requiring careful monitoring or intervention such as intravenous fluids, observation or surgery, referral to an equine hospital may be recommended. Colic in Horses, treatment of a horse or pony with colic, causes of equine colic. 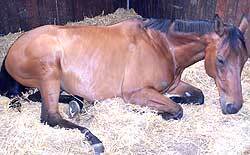 Description of the symptoms and signs of colic and abdominal pain in horses.